Luxury with elbow room. The people and staff at this property care about you. You feel it in the atmosphere and in the food. There are several options and well –thought out spaces for private relaxation. The smallest bungalow here is over 1,900 sq.ft. This property is an excellent place to unwind. La orana and Maeva! 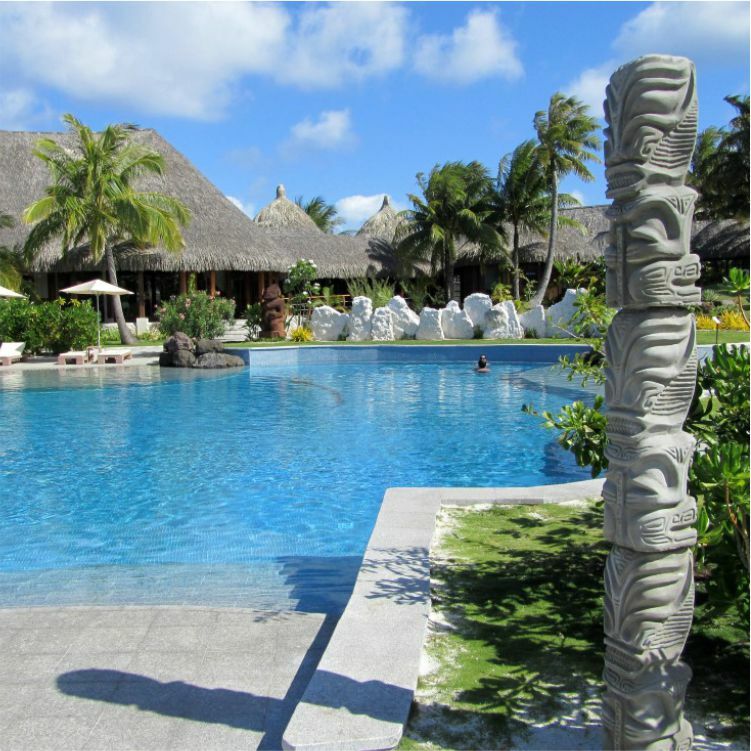 to Tahiti’s jewel in the crown, The St. Regis Bora Bora Resort. Those two Tahitian words mean “greetings” and “welcome,” and mark the beginning of every captivating visit to French Polynesia, the world’s ultimate paradise. In the shadow of Mount Otemanu, by the shores of the most beautiful lagoon on the planet, The St. Regis Bora Bora Resort beckons to discerning travelers. A private-island resort with 44 acres of extraordinarily magnificent landscaped grounds, it is a Polynesian dreamland matched with the unsurpassed bespoke signature service that only St. Regis hotels can offer. Choose a spectacular overwater villa, a pool beach villa, oceanfront retreat villa or the Royal Estate (a 13,000-square-foot distinctive private home); regardless of which gorgeously appointed accommodation imbued with Tahitian tradition becomes home, the gracious service and refinement of The St. Regis Bora Bora Resort is always at the ready. Be sure to explore the private “motu” (island) in the lagoonarium where the seductive Miri Miri Spa by Clarins awaits; take time to snorkel in the warm waters of that protected area; or simply relax at the pristine beach, looking out across the aquamarine sea to the spectacular view of Mount Otemanu nearby. Plan a flawlessly stunning engagement or wedding here, celebrate a honeymoon, renew vows on an anniversary or simply bring the family for an unforgettable and extraordinary holiday – The St. Regis Bora Bora Resort Tahitian experience is always Beyond Expectation. Set on a lagoon, this luxe tropical beachfront resort is 3 km by boat from Mount Otemanu volcano and 2 km from the Bora Bora WWII Guns historic site. The chic villas offer Wi-Fi access, lounges, private gardens with open-air showers, and decks with plunge or infinity pools. Most are beachfront, while 1 adds a kitchen, a private beach and a chef (on request). Thatched over-water bungalows have furnished terraces and glass panels with lagoon views. Butler service is free. Amenities include a spa, an outdoor pool, a rustic-chic bar and 4 restaurants, including an Italian eatery. There’s also a gym.